AUBURN HILLS, Mich.--(BUSINESS WIRE)--GKN Driveline Torque Technology in Japan has recently received the prestigious Nissan Global Innovation Award for its contribution to the independent four-wheel-drive (4WD) transaxle featured in the all-new Nissan GT-R supercar. Nissan’s Global Innovation Award recognizes suppliers for innovation in product and technology development as well as process and management improvements. 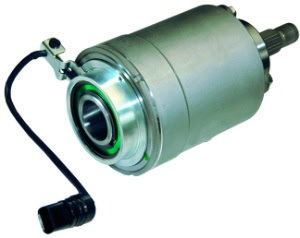 * The high-performance, light-weight aluminum final drive unit (FDU). In order to evenly distribute vehicle weight throughout the car, the transmission, transfer case and FDU are all placed at the rear of the Nissan GT-R. GKN Driveline’s FDU was integrated into the transaxle. * A powerful “1.5 way” Limited Slip Differential (LSD). This unit generates optimum traction and stability under all driving conditions and is fitted inside the rear FDU. * The all-wheel drive coupling. GKN Driveline's Electro-Magnetic Control Device (EMCD) is fitted in the vehicle’s transaxle and controls an optimum power flow to the front wheels. The new EMCD has a lightweight aluminum case, improved responsiveness and higher energy savings by minimizing electrical use. “Our GT-R products are truly advanced technologies and demonstrate GKN Driveline’s engineering and production expertise at the highest level,” said Walford. “The successful delivery of this project is a great credit to our team and represents another major step in the continuing success of our growing operations. GKN Driveline also supplies the front sideshafts for the Nissan GT-R.
GKN Driveline is the world leader in the design and production of driveline components. 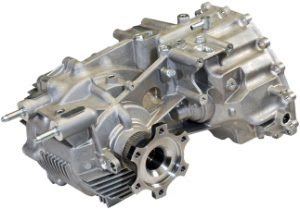 Producing systems and components for the smallest ultra low-cost vehicle to the most sophisticated four-wheel-drive model, GKN Driveline has the products to achieve the optimum driveline solution. With these products come technical expertise and an understanding of all aspects that affect vehicle dynamics and how these can be optimized for weight and performance improvement. Every year, 72 million cars and light trucks are produced for the world’s roads. For every vehicle, in every country, the challenge is always the same: to transmit power from the engine to the wheels in the most efficient, economical and reliable way possible. GKN Driveline designs, builds and supplies the most extensive and widely-used range of driveline components in the automotive industry. It covers every application from entry level front-wheel-drive vehicles to the most sophisticated four-wheel-drive vehicles. As an engineering business with extensive automotive experience and a global resource network, GKN Driveline delivers solutions quickly, economically and efficiently – from drawing through to full-scale production. The company is a true partner to the world automotive industry. Multi-talented, multilingual global account teams work closely with each and every customer to develop a clear understanding of their requirements – and then deliver optimum solutions accurately engineered to all specifications. GKN Driveline is a global tier-one supplier of vehicle driveline components and systems with annual sales of $4 billion (£2 billion). The company has 21,000 employees and 40 facilities in 30 countries.